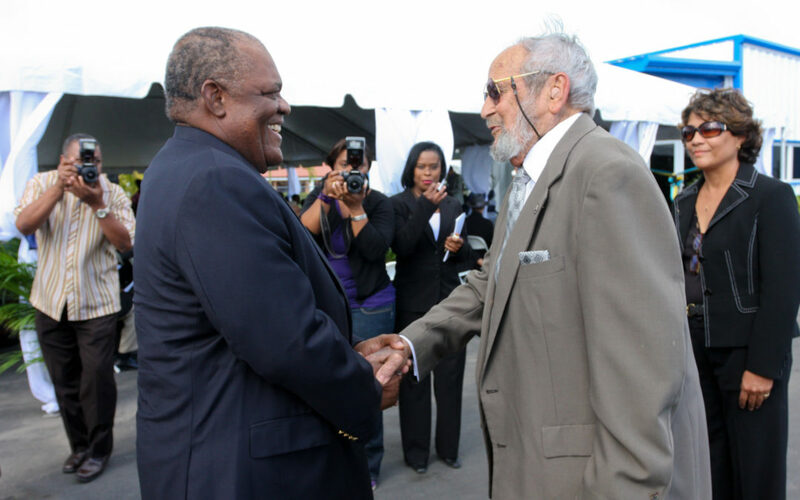 FREEPORT – Prime Minister Hubert Ingraham congratulated Harold “Sonny” Waugh on the opening of Waugh Construction’s new corporate offices on Saturday as the company celebrated its 45th anniversary. Mr Ingraham noted that Mr Waugh, with his family, was able to successfully transform a small family business into a multi-million dollar operation. “It is inspiring to read the story how you evolved your business interest in the small supply operation in West End into this conglomerate today,” he said. Waugh Construction opened in the early 60’s for the purpose of land clearing and road works on Grand Bahama. Today, the company employs 83 Bahamians and provides a full spectrum of civil construction services. Mr Waugh continues to head the company, along with his sons, Godfrey and Brian Waugh who both serve as vice presidents, and Kevin Waugh who is the project manager. Prime Minister Ingraham recalled first meeting Mr Waugh some 30 years ago while he was a young MP in Abaco when Waugh Construction was undertaking work on the Treasure Cay Airport. He noted that although there is need for some repair, the airport is still in relatively good condition. Mr Ingraham stated that Mr Waugh is reliable and has successfully completed a number of works over the years throughout the Family Islands. “Of all projects I am aware of that Mr Waugh has been involved in, and certainly he has been involved in a number since I have been in office in 1992, we have never had any concerns whatsoever of the quality of work, time completion, or honesty of the persons who are performing the job,” he said. Waugh Construction is currently involved in work at Vopak Terminal Bahamas, which is undertaking a multi-million expansion at BORCO. “I want to note my satisfaction of what you and other local contractors are doing here (on Grand Bahama) in respect to the expansion of Vopak and upgrading the facilities at BORCO,” he added. Mr Ingraham said he was happy to be able to attend the opening of the new corporate office on John Maxwell and Milton Streets off Queen’s Highway. He described it as a significant milestone. “These are not good times for the global or Bahamian economy and few have been able to avoid the impact of the downturn. “In spite of this, though, the position of Waugh Construction to upgrade and enlarge its corporate office… reflects Mr Waugh’s dedication to his business and to his clients in Grand Bahama, and indeed the Bahamas. “This company is a good example of small family business that, well managed and operated, transformed what was a relatively small land clearing and road paving operation in early 60’s into a multi-million dollar operation, offering a vast spectrum of civil construction services and employing more than 80 Bahamians on a full time basis. “There are not many companies that can employ 80 persons in the Bahamas. Indeed, I am very impressed by the number of your family members who are integrated into your operation. Your continued success I have no doubt defies any question of doing business with family. Mr Ingraham said Mr Waugh is also a good corporate citizen in the Bahamas, contributing to Bahamas Air Sea Rescue Association, Bahamas National Trust and Humane Society of Grand Bahama. Harold Waugh thanked his employees who have also contributed to the success of the company. He recognized all of the long serving employees who have worked more than 20 years with the company. RIBBON CUTTING: Prime Minister Hubert Ingraham participates in the ribbon cutting at the 45th anniversary of Waugh Construction Bahamas Ltd., and the official opening of its new corporate office on Saturday. Pictured from left are Mr Ingraham; Lee Malone, member of the Waugh Construction company’s Board of Directors; and Harold Sonny’ Waugh, president of Waugh Construction.